Mrs. Poonam Shrivastava is the Retired Judge, from Allahabad High Court. She enrolled as an Advocate in the year 1972 and practiced in Civil, Criminal and Writ matters at Allahabad High Court. 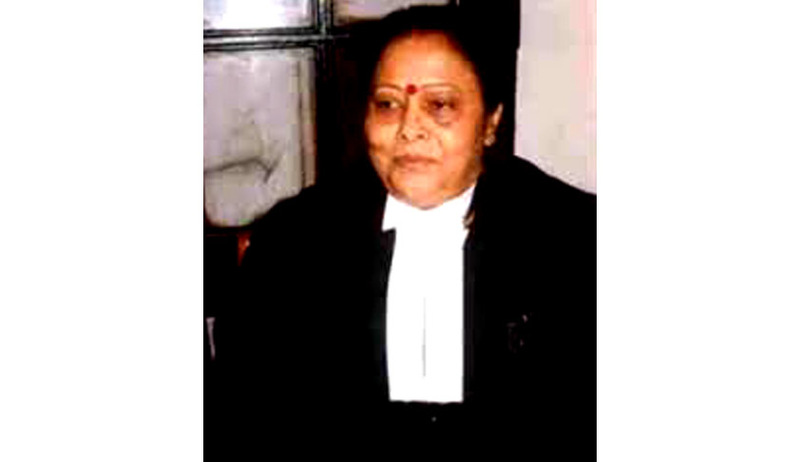 She was elevated on 07/01/2004 and has the rich experience in serving Allahabad and Jharkhand High Court. Live Law: Please tell us about your decision to choose Law as a career? Justice Poonam Srivastava: That is a long Story, I was a Science student and wanted to become a Doctor . Since PMT at that time (when I was appearing for PMT) was so much rigged that I appeared only once and then I went to the High Court (Allahabad), I saw the atmosphere there, I then and there decided that I should join Law and not sit for any judicial Services competitions, but will practice. At my time, here in U.P, there were hardly any lady (practicing), there were lot of restrictions outside and within the family. People objected, but I took it as a challenge. I think that I thoroughly enjoyed practicing law and (with a laughing gesture) instead of a white coat I adore my black coat. Live Law: Judge, can you tell something more about your early years that must be inspiring to the youngsters. Justice Poonam Srivastava: Again, because I am a lady, my answer would be pro-women. When I joined Law I was not getting any work. I used to sit in a bar room with the number of other advocates and few of them were not appearing in some cases due to non-payment of full fee. I took it as an opportunity, started asking them that “if you don’t want to argue you can give me your brief, I don’t want a single penny and let me argue the case.” I should be thankful to God, when I used to argue free of cost and by the time I get out of the courtroom, after winning the case, at least there would be 3 or 4 people asking for my visiting card. In a month, I argue 3 or 4 cases without fee, and it fetched me 4 or 5 case (which I could charge) and that is how it started. Anyway, every step was a challenge and I found that early years were so good that it gave me all the more courage. You would not believe, when I was there, there was only 3 lady advocates. Today there are atleast 600-700 lady advocates and I feel very happy about this fact. Live Law: As a former judge, how do you look at ‘male dominance’ in Indian Judicial System? Justice Poonam Srivastava: Still, very - very dominating. I can tell you I have been subjected to so many discriminations that if I start counting the instances probably there would be no end. When I used to sit with the senior judge, he would say in the chamber “don’t make the difference of the opinion, take your judgement, I will abide by it but in the open court don’t differ with my opinion”. . There were so many prejudices, in my time. Egoism, I have faced it, the male egoism is very much apparent. Till date India has not witnessed any lady CJI. This is a clear example of male dominance in Indian Judiciary. Live Law: We have been seeing the difficulties faced by a woman lawyer. One has to be a professional and mother simultaneously, how is it possible to balance the personal life and professional life? Justice Poonam Srivastava: Very difficult but then not impossible, I have done this with my children and with my in-laws. I have taken care of everything from cooking to looking after the children. If the case is allowed, my colleagues or other people would say that “It is allowed because you are lady and the judge found pity on you”. If the case is dismissed, it was other way around, “you are not able to argue”. So, this was very difficult to handle as a mother, as a wife, as a sister, or as a daughter. But I had to balance otherwise they (the critics) would say “you better sit at home”. Live Law: We don’t have adequate infrastructure for women lawyers like crèches, decent toilets, which in fact infringes the privacy, how can we address this issue? Justice Poonam Srivastava: I agree, there is nothing but when I joined the profession there was not even a female toilet. We had to fight three or four years for a female toilet to be constructed. When we wanted, we would go to civil lines market (2kms from the High Court) to use a picture hall washroom and come back to the Court. But still a lot is lacking, to talk about crèches or baby care centres, there is nothing at all, the lady has to face so many problems and a lot has to be done. Live Law: your comments on Sexual Harassment complaints from law students and lawyers? Justice Poonam Srivastava: I am happy that now the government has given such a law, that ladies are able to speak out. This harassment is right there from the beginning but during my time, if we open mouth against anyone, people would say that there is fault with the female but now girls can very well complaint taking recourse to the new provisions of the Act against Sexual harassment. I am really very happy about the development that has taken place. I wish that this continues. Live Law: Can you throw some light on one of your famous/favourite judgement and subjects. Live Law: What is the expectation from a Law School/University in India? Do you think that there is no adequate attention to other State run law Colleges in terms of funding and training? Justice Poonam Srivastava: National Law Universities are definitely better. They produce quality lawyers, lawyers as demanded in this times. The law during my time was the last option. Now students opt for law as they opt for any other field. The study of law is now more lucrative. There is new curriculum. So, definitely there are many expectations from such students. Other State run Universities are as good as National Law Universities, of course students are not that much trained. Other universities have also started moot court competition etc but a lot has to be done. Live Law: how far is the mediation and conciliation centre at Allahabad High Court is effective? Your views on Alternative Dispute Resolution (ADR) form of Dispute Resolution? Justice Poonam Srivastava: I must say it has to be made more effective. This concept was taken from foreign countries, so it is more effective there (in foreign countries) as compared to India. Live Law: what is the most difficult thing that comes in way of deciding cases? Justice Poonam Srivastava: difficulty arrives when we hear arguments from both the sides. When I dictate orders, I would think that this should be dismissed rather than allowed, the State of dilemma would follow during dictation and again the mind would say that this should be done otherwise. Secondly, when judges decides the media hyped cases, they wonder whether it was correctly decided or not. Media is not scared now and it started to criticise the decisions openly. There are both pros and cons and at the time of delivering the judgment, a balance is difficult to maintain. Live Law: Now that you are retired, how is this second inning of your life going? Did you miss judiciary? Justice Poonam Srivastava: I miss legal work. I want to do something. Now that I am retired, I pursue my hobbies like listening to classical music, reading books. Of course I miss judiciary in the sense that I miss legal work. Still I want to work. Live Law: Students from Law Universities are likely to go for corporate jobs, what are the avenues in judiciary or litigation? Justice Poonam Srivastava: In corporate Jobs, there is good money right from the day One . Otherwise, nothing is better than a professional challenge. Practising is like being a “jack of all trades” where you get all round knowledge. Profession is better. Of course in the initial years there is hardly any money but you know sky is the limit. Thank you Judge for talking to Live Law, we wish you all happiness in future. What is your message for the youth of the country? Justice Poonam Srivastava: first of all, they should respect ladies, they should give them equal opportunity, equal right as yours, and they should walk shoulder to shoulder with everyone. They should have a sense of duty towards their family. They should be faithful to their country and countrymen. This will make India a better Country.